You want control over your comedy. You want to be able to be more efficient with your writing. You have an idea that you know is funny but you can’t seem to get the laughs you know it deserves. Each time the audience laughs there are certain stimuli present that triggered the laughs. What if you could harness the stimuli and use them at will? Better yet… When an idea gets a groan or no laughter, wouldn’t you like to know what’s missing and how to fix it? It’s not a bunch of fluff… it’s 192 pages of solid comedy-writing content! 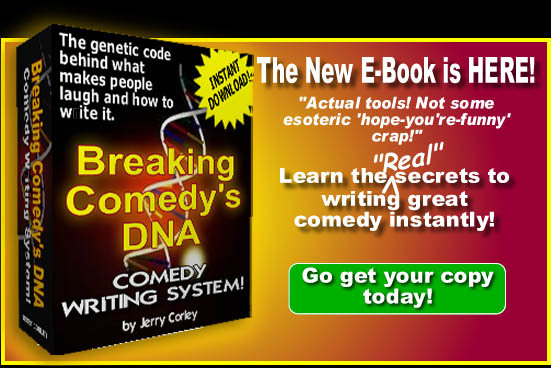 Get the INSTANTLY DOWNLOADABLE book, shave your learning curve by YEARS and change your entire outlook on comedy writing! This E-book comes with a full 30-day money-back guarantee! If you’re not satisfied, please send me an email for a complete refund!